We are interested at Electric Race News in changing the fuel of Racing, and while we think Electric is the way to go, there are carbon neutral liquid fuels that are renewable and do not tap fossil oil resources. Quimera has made an announcement showing they're not just about electric racing, but zero carbon racing. They made an announcement at AUTOSPORT International last Thursday concerning an agreement with IFR Automotive and Air Fuel Synthesis for a race car powered by a completely renewable carbon neutral liquid fuel powered race car. The carbon-neutral Aspid SS sportscar weighs 780kg, and produces 450bhp from its two-litre engine. Apparently there is a possibility to launch a one-make racing series around this car. What is this? An internal combustion engine race car on Electric Race News? The answer of why it's here comes from the fuel company, Air Fuel Synthesis. The technology developed by Air Fuel Systems takes carbon dioxide out of the atmosphere, and extracts hydrogen from water, then reacting them together to make a hydrocarbon mixture. There are several paths from that hydrocarbon gas to end up with liquid gasoline. It requires an energy input to drive the system, and in their implementation that is accomplished with solar power. The point is that the gasoline which results from the system is sourced from carbon already present in the atmosphere. None of it comes from fossil oil, and by using solar power to drive the system there isn't a back-door dependency on fossil fuels. The company is still in early demonstration phases but claim that by 2020 they'll have developed commercial scale plants. Drayson Racing Technologies is, unsurprisingly, the first team to be officially approved by the FIA for entry in the Formula E global electric championship. It was announced at the Low Carbon Racing Conference, in the UK. What is surprising is that Drayson will not be driving their own car, but instead racing with the new Formula E customer racing car, that will be supplied by Formula E Holdings. 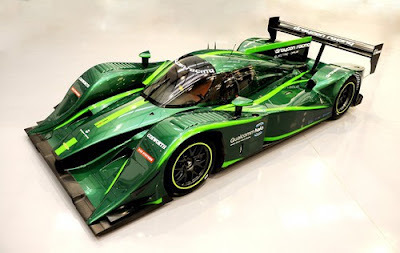 Drayson Racing Technologies has built the Lola-Drayson B12/69EV electric race car and taken it to events around the world. I got to see it at EVS26 in May 2012, and it is a way-cool looking electric race car. This is their rendering, and it looks cooler in person. The team is looking to have two drivers, and Formula E Holdings allocates four cars to each team. During 2013 DRT will be working with Spark and Formula E Holdings on both testing the Formula E "customer car" as well as the exhibition events that are going to be held around the world. The 2014 Formula E season will consist of 10 races, racing on city street circuits in cities around the world. They recently signed Rome Italy as one of those cities. Drayson Racing Technologies has been pioneering green racing initiatives since 2007 and has been acting as Scientific Adviser in terms of sustainability to the FIA Formula E Championship during its establishment over the past few months. Alejandro Agag, Chief Executive Officer of FEH, said: "Today is a very special day for the FIA Formula E Championship. Announcing Drayson Formula E team as the first of the 10 teams proposed to take part in the competition is a very important step in the creation of the first sustainable global motor sport Championship. “Lord Drayson is a true pioneer in electric racing, and our championship identifies completely with his goals and his ambitions. We look forward to see the Drayson Formula E Team racing in the heart of great cities around the world, first with the Spark customer car, and then with his own technology, that will contribute to the advance of electric cars in our cities." This teaser picture was posted by Brammo on Facebook showing a part of the Empulse TTX. It is based on Empulse R (as expected) so all the positive experience Empulse R owners are giving will be carrying over to the TTX. This should put the Empulse TTX in the group which was called eSuperStock during the 2012 season. That award group was made up of electric motorcycles in production quantities over 25 units sold. By the time the season starts Brammo will have delivered 25 Empulse R's, I'd imagine. We should expect Empulse TTX details to be announced shortly because teams need to start lining up their bikes for the 2013 season. According to a news release from the Isle of Man TT, the TT ZERO race will have an additional qualifying/practice round. In November 2012 they released information for the 2013 TT Race Programme, saying that it would be largely unchanged from the 2012 program. One major change will be the additional qualifying lap for the TT ZERO, which is an improvement over past TT ZERO's but does not bring parity between the number of practice laps for TT ZERO bikes versus gas powered bikes. The TT Zero race qualification laps will be on May 31, June 1 and June 3. The news release says this however: "Qualifying for the 2013 TT will begin on Saturday, May 25, with sessions for Lightweight machines, all solo Newcomers and Sidecars, with the Superbikes, Supersport and Superstock classes starting their qualifying programme on Monday, May 27. Final qualifying takes place on Friday, May 31." If "qualifying" finishes on May 31, how come TT ZERO "qualifying" doesn't BEGIN until May 31? The TT ZERO race will again be on Wednesday, June 5, alongside the second Supersport race, and second Sidecar race.